One of the biggest trends in online information is the two-way conversation. To what extent did the candidate Web sites take advantage of the potential for users to “converse” with candidates and the campaign? To a greater extent than many information sites. All candidates offer at least one way for users to “converse” with the candidate or the campaign. The majority even let voters talk to each other. And, unlike most of the mainstream press, the candidates have gone one step further. They have found a way to turn the dialogue into action—putting the user to work for them. PEJ assessed the degree of engagement and participation at two levels. First, we looked to see if the Web sites offered any of three main features that allow visitors to engage in the conversation: commenting on blogs, creating their own citizen blogs and being able to connect with the candidates on various social networking sites. Next, we measured the degree to which citizens were then encouraged to turn the dialogue into grassroots action. Here, we looked for three different components: raising money, hosting community gatherings or registering to vote. Finally, we tallied how many of the six different features each site contained and ranked them accordingly. In 2004, Howard Dean gained significant attention and generated a cadre of youthful workers to his campaign through the use of a blog on his Web site. The notion that a candidate would regularly speak directly to supporters struck observers as exciting and new. Three years later, campaign blogs are mainstream. Fifteen of the 19 sites contain them—including all of the top-tier candidates. Most of the blogs appear to be authored primarily by one or two campaign staffers, though Mitt Romney’s blog is written by his five sons and focuses more on family updates than the campaign. Two of the four candidates who do not have blogs—Dennis Kucinich (D) and John Cox (R)—offer similar alternatives: user-based forums or links to outside blogs. In fact, it is no longer enough just to blog. Now, “readers” want—or rather expect—to be able to join in. And, here again, candidate Web sites have excelled. Of the 15 candidates who have official campaign blogs on their sites, all but two (Rudy Giuliani and Ron Paul) allow users to post comments on blog entries. Some candidates have taken blogging even one step further in 2007. Just over one-third of the Web sites encourage supporters to stir up community support by starting their own blogs on the site. Seven of the 19 candidates—though only two front runners (both Democrats)—host citizen-initiated blogs: John Edwards (D), Barack Obama (D), Bill Richardson (D), Duncan Hunter (R) and Sam Brownback (R). Serving a very similar function, Dennis Kucinich (D) and Mike Gravel (D) host community-based discussion forums on their sites. The Web site of Barack Obama, for example, allows users to create their own personal blog, similar to services like blogspot.com and livejournal.com. John Edwards gives users the tool to establish their own “diary,” a feature similar to that offered by the popular liberal blog, Daily Kos. On Sam Brownback’s campaign site, visitors are invited to become members (by registering a profile) and to contribute posts to the official blog. On all these sites most visitors use the platform to voice their support for the candidate or to inform their peers of upcoming events. Most notably perhaps, social networking sites—the latest phenomenon in online communication—have taken the 2008 election by storm. Social networking sites like MySpace (the most popular), Facebook, YouTube, Meetup and Flickr facilitate interaction among people who share something in common—in this case, interest in a particular candidate. Users who register on one of these sites can then “meet” and network with any other registered user, including the presidential candidates. On MySpace and Facebook, networks are established by becoming “friends” with other users and posting comments to them. Most candidates offer links to a number of different networks, but Democrat John Edwards surpasses others in the ability to ‘connect’ with him. His site features 23 unique social networking sites and a full page dedicated to these networks. 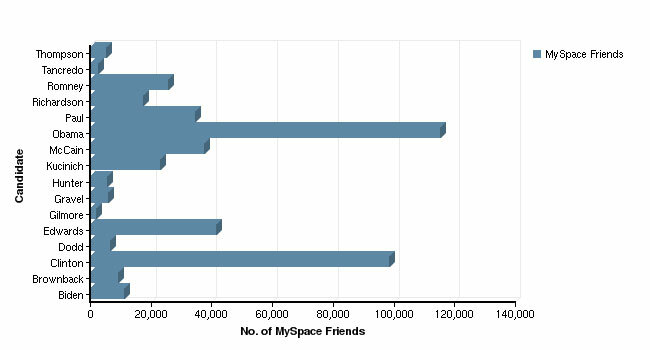 To gauge the magnitude of social networking among candidates, PEJ tallied the number of “friends” each candidate had on the MySpace Impact page. The Democrats took the lead: Barack Obama had three times as many “friends” as John McCain, the leader in “friends” for the Republicans. Presumably, social networking creates enthusiasm, drives traffic, and might translate into both fundraising and votes. In theory, it might be particularly helpful in caucus states, such as Iowa, where getting someone to actually turn out for you involves more than just going to a polling place for a few minutes to cast a quick vote. What about moving beyond networking to community activity—everything from hosting fundraisers, organizing community events and learning where to register to vote—not to mention, the old standard of soliciting donations? 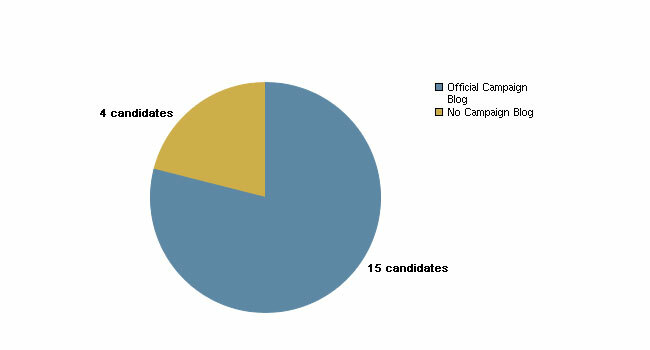 All 19 candidates use their Web site to solicit donations, but many go several steps further. Eight candidates (four Republicans and four Democrats) provide supporters with tools for hosting fundraisers. Bill Richardson, for instance, allows users to create and manage their own fundraising page. Rudy Giuliani offers an email form letter that supporters can send to their friends to encourage them to donate to the campaign. In addition to fundraising, 12 of the 19 campaign Web sites help supporters organize grassroots events such as house parties in their communities to help raise awareness and support for the candidates. Six of the eight Democrats promote such activity and five of the eleven Republicans do the same. The least common tool, though perhaps one of the most fundamental, is information on registering to vote. Only four candidates provide this: John McCain (R), Barack Obama (D), Hillary Clinton (D) and long-shot candidate John Cox (R). Cox offers a PDF document explaining the process while Barack Obama provides a link to an external site, govote.org, where citizens can complete the registration process online and mail in their forms. How do the different sites stack up in engagement with potential supporters? We tallied the six different features discussed above and found that Democrats, particularly top-tier ones, had the most, and Barack Obama out-paced all others. He was the only candidate to offer all six methods we identified. Democrats Hillary Clinton, John Edwards and Bill Richardson had five out of six of these features (Clinton did not offer citizen blogs and Edwards and Richardson did not offer voter registration tools). Republican candidates were far less likely to have participatory features, even those leading in the polls. Mitt Romney had four of the six features, John McCain had three, and Rudy Giuliani had two. Surprisingly, long-shots Duncan Hunter and Jim Gilmore scored pretty well on the scale, featuring four of the six participatory tools that PEJ identified (Hunter did not feature a campaign blog with comments while Gilmore did not offer citizens the ability to establish their own blog on the site; and neither offered tools to register to vote). 1. Rudy Giuliani has a MySpace page, but he does not promote it from his campaign Web site. You can find it by visiting the Impact MySpace page (www.impact.myspace.com), which displays those candidates who host a page. Mike Huckabee also has a MySpace page, which one can find by visiting an alternative campaign Web site called Team Huckabee (www.teamhuckabee.com/blog). 2. These six features include: user comments on campaign blogs, opportunity to establish citizen-initiated blogs, fundraising, community events, voter registration information and social networking sites.